La Jolla Cove is a beautiful, small beach nestled between sandstone cliffs near San Diego. La Jolla Cove is part of a marine ecological reserve, making it one of the best places to snorkel or scuba dive in Southern California. We visited on a sunny day in August to check out the tide pools and the sea lions, and wished we could have stayed longer! I can vouch for the helpfulness of the lifeguards because my 7-year-old son fell on a rock when a wave crashed into him and sliced his shin open. As he screamed like a banshee, the lifeguards came running and helped us bandage him up, thus ending our outing. In the short time we were there, we dug through the seaweed and explored the tide pools and found many snails and crabs. 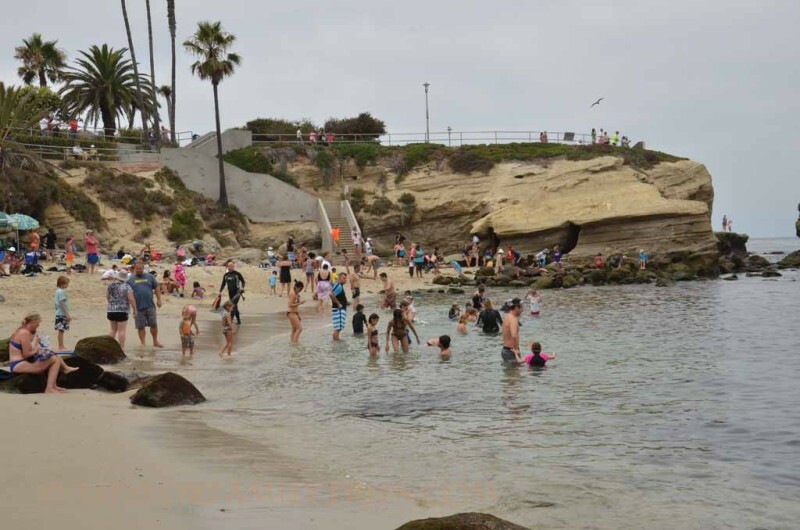 La Jolla Cove is not a traditional, San Diego surf beach. But if you want to explore tide pools, snorkel, or watch sea lions, this is the beach for you. If you go, here are a few things you should know about La Jolla Cove. Surfboards, boogie boards, kayaks, and inflatables are not allowed at La Jolla Cove. Instead, bring buckets and shovels for exploring and your snorkel gear if you want to get in. You can rent snorkel gear nearby. La Jolla Cove is a look but don’t touch location. You are not allowed to touch or remove any marine life from the beach. La Jolla Cove is nestled between cliffs so big surf doesn’t crash on the beach. It is usually a great place for children to play on the sand and in the water. However, as evidenced by the large gash on my son’s shin, the waves can be powerful at times. The rocky sections of the beach, which host wonderful tide pools, can be slippery. La Jolla Cove is a great place to snorkel. La Jolla Cove is located just east of Scripps Park, which is filled with grassy areas for picnicking or playing ball. There is a public restroom and outdoor showers where you can rinse off after a day at the beach. We weren’t able to stay to snorkel, but I wish my older children could have done it. Apparently the snorkeling is great at La Jolla Cove, with tons of colorful garibaldi, yellowtail, rays, and occasional sightings of the benign leopard shark. My children loved exploring the caves and tunnels in the sandstone cliffs. If you want a closer look at the La Jolla Caves, I highly recommend ocean kayaking with Bike and Kayak Tours. Location: East side of Scripps Park in La Jolla, Ca. Street parking is hard to come by so arrive early or be prepared to walk. Hours: La Jolla Cove is staffed by a lifeguard from 9:00 a.m.-dusk daily. Dogs allowed before 9:00 a.m. or after 6:00 p.m. Amenities: Bathroom and shower facilities. Picnic areas at Scripps Park.